There are three possible pathways for teams to earn spots in the 04-00/01 2018-19 NPL competition. In the 04-00/01 age group the majority of the teams will qualify based on their 2017-18 NPL results. All Champions League, NPL 1 and NPL 2 (except 01G) will qualify for the 2018-19 NorCal NPL. In the NPL 3, only up to half of the teams will auto-qualify. Click on the link below for an NPL division by division breakdown on where NPL teams need place to auto-qualify for 2018-19. The winner of the 2017-18 Spring State Premier Championship division also earns an automatic spot in the 2018-19 NorCal NPL. In addition, the 2nd-5th place teams from the State Premier Championship earn an automatic spot in the 2018-19 NPL Qualification League over the Summer for one last chance to qualify for NPL. The final chance for teams to qualify or re-qualify for the 2018-19 NorCal NPL will be via the NPL Qualification League played over the Summer. The number of spots available in each age group will be determined in late May. NPL clubs (non-NPL teams), 2nd-5th place State Premier Championship teams, and 2017-18 NPL relegated teams are all automatically accepted into the Qualification League. In addition, in some age groups, additional spots may be available and will be chosen by NorCal based on past history in NorCal and other top competitions. There are three possible pathways for teams to earn spots in the 05 2018-19 NPL competition. NPL Clubs each have an automatic spot in the U14 NPL age group. NPL clubs are awarded based on history of team success, technical/coaching standards, college/professional player production and administration. Wild Cards are invited for the U14 NPL division if they have finished in the top 4 in NorCal State Cup (highest division) or finished in the top 4 of the Cross-Regional Playoffs and have a coach with a minimum of a USSF “C” license (or equivalent). The final chance for teams to qualify or re-qualify for the 2018-19 NorCal NPL will be via the NPL Qualification League played over the Summer. The number of spots available in each age group will be determined in late May. 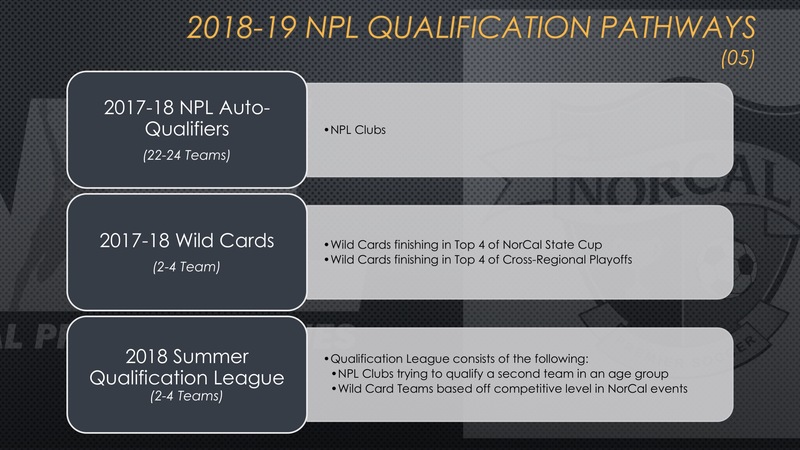 NPL clubs looking to qualify a second team in an age group will be accepted along with other high level Wild Card club teams based off performance in previous NorCal competitions.